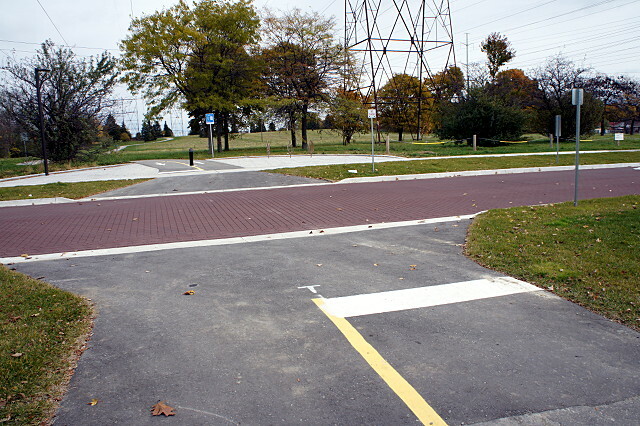 At the western terminus at Victoria Park, there's no curb cut, no signals, no nothing to help cyclists get across the street to continue heading south or west. Traffic on Victoria Park can be hairy at the best of times and it seems odd to just dump cyclists here with no further assistance. 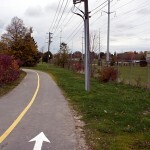 In the future, the path should continue past Victoria Park to meet up with the Don Valley trails. 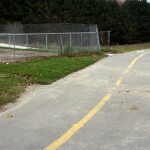 The Metro-era portion of the trail between Pharmacy and Victoria Park shows its age in this giant bump where a drainage pipe runs under the path. I would rate this bump as "bone-jarring". 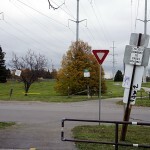 Where the trail crosses Pharmacy, wayfinding signs point the way north or south on bike route 61. 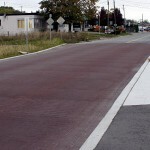 The irony is that the Pharmacy lanes, even before they were pulled out last month, didn't reach this far north. 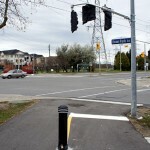 At Warden, I encountered the first working set of bike signals. The ones at Pharmacy were installed, but not yet operating. 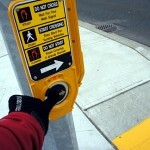 There are separate buttons for pedestrians and cyclists, but they both do the same thing. 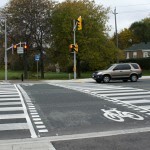 All of the major road crossings have (or will have) a dedicated crossing lane for cyclists right beside the pedestrian crossover. 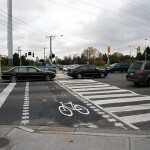 It's so nice to be able to ride across an intersection legally like this. 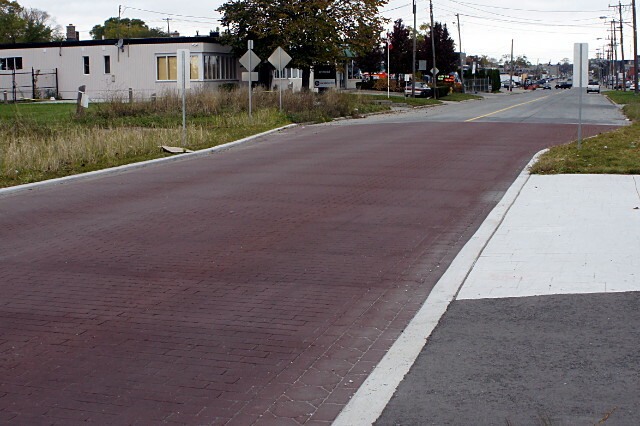 At Crockford Boulevard, the first minor crossing, the street changes from asphalt to paving bricks and cyclists face a yield sign instead of a "dismount to cross" sign. How civilized. 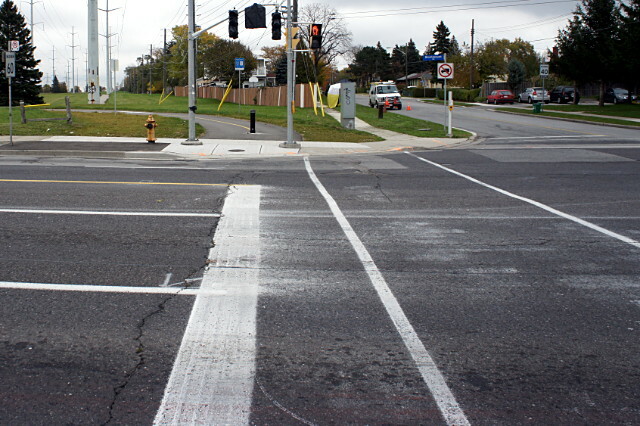 Crockford is pinched down to two lanes at the crossing, which combines with the surface treatment to get drivers to slow down. That didn't stop one yahoo from doing about 80 across this stretch while I was there, screeching to a halt, doing a U-turn, and racing back up the other way. 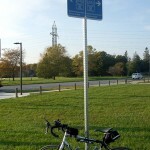 I'm not exactly sure why this sign on an old Metro portion of the trail is telling cyclists to dismount to cross. 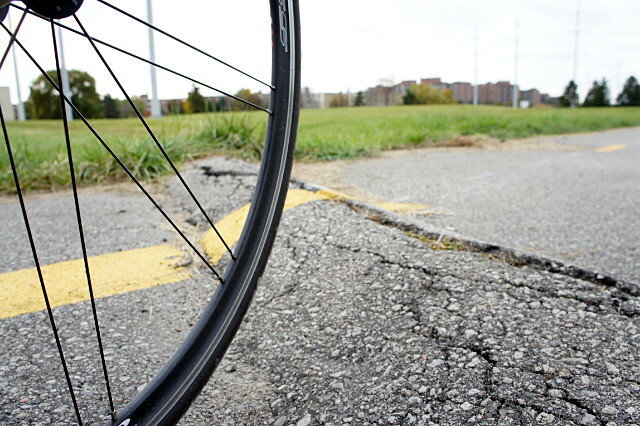 There's nothing here except that tiny little crack in the asphalt. 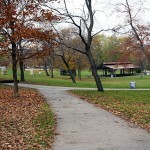 ...as I headed wast in the afternoon, a crew was already working on it. 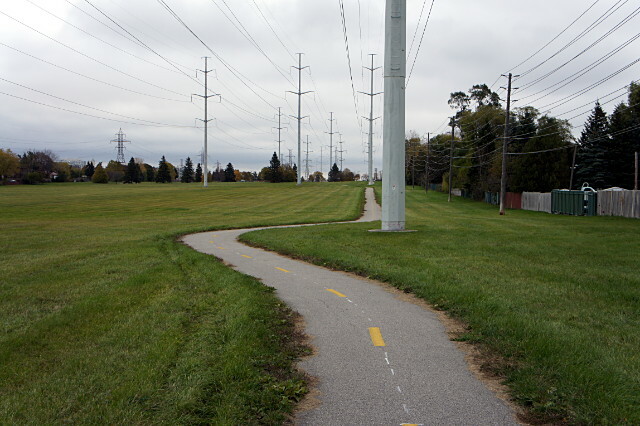 I didn't understand quite why the path east of Birchmount was set dead-centre between the hydro pylons, only to have to make a big arc of a detour around each one. 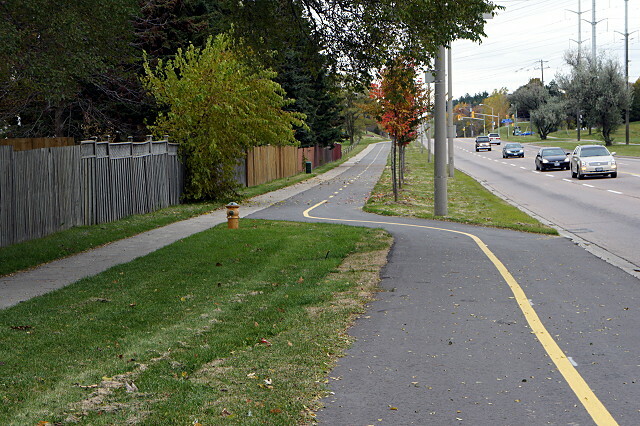 There was plenty of space on either side to put in a straighter path. The scenery in a hydro corridor can be fairly monotonous, but it's still quite relaxing when compared to fighting with suburban traffic. Although the view is largely the same from one section to another, there's lots of local flavour if you keep your eyes open. At the crossing of Givendale Road, there's some confusion. 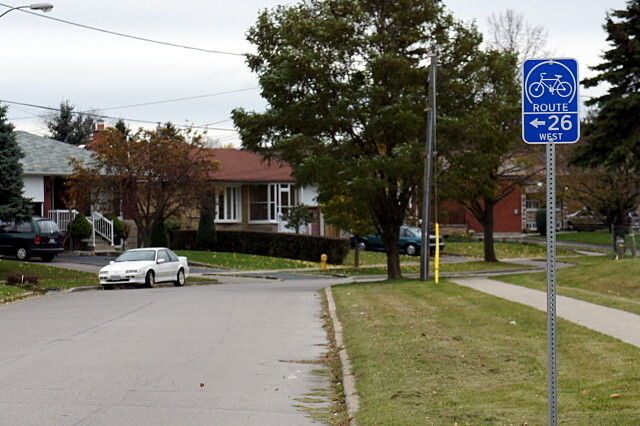 The trail clearly continues on the other side of the street, and is even labelled "Gatineau" with a Metro-era sign. 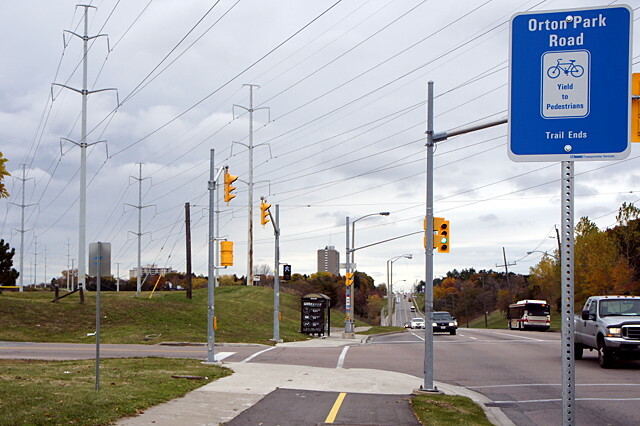 But there's also a sign that says route 26 (the Gatineau corridor) continues to the right, not straight ahead. 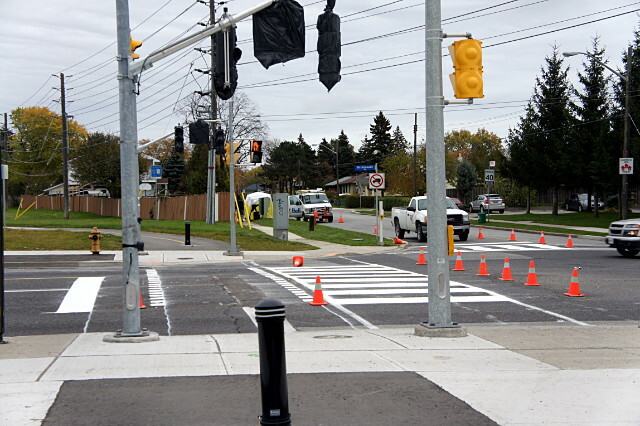 It turns out that the route straight ahead takes you out to a dead end at Kennedy Road, where you'll have to either ride on the sidewalk to a nearby signalled intersection or try crossing mid-block. 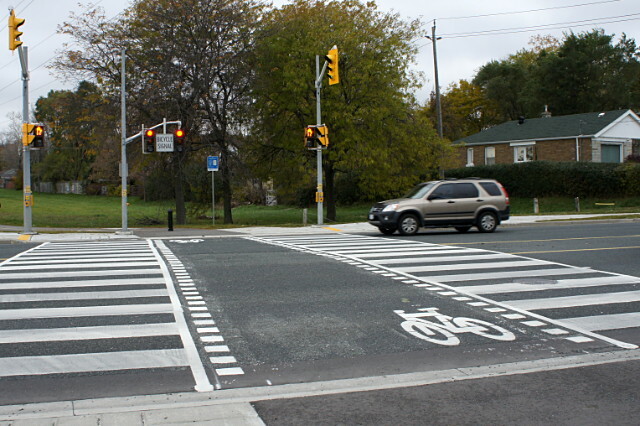 Turning right takes you onto a local road that has a signalized intersection with Kennedy Road, where you will pick up the trail again. Confusing. 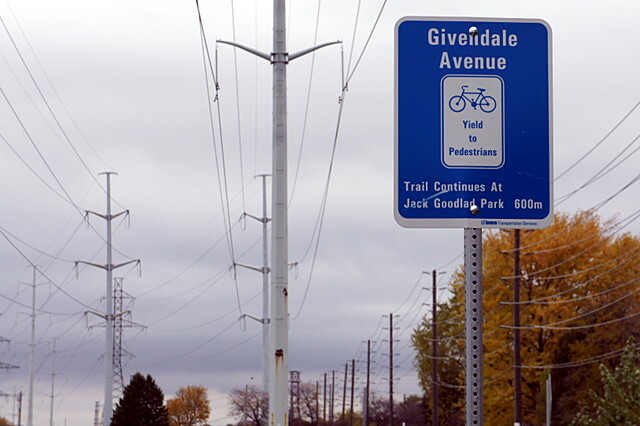 Oh, and this sign should say Givendale Road, not Givendale Avenue. 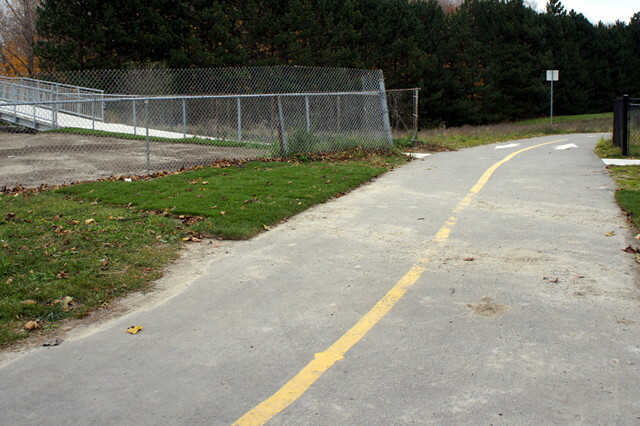 As you join the trail again in Jack Goodlad Park, you encounter this abrupt blind turn around a public washroom in the park. 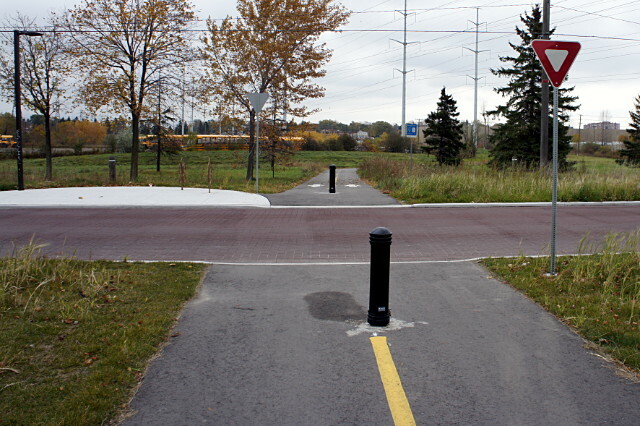 There's plenty of room on either side of this turn to straighten it out a bit and make it a bit less dangerous. Of course, moving it over a bit on this side would have required taking out one or two parking spots in the lot behind the camera. 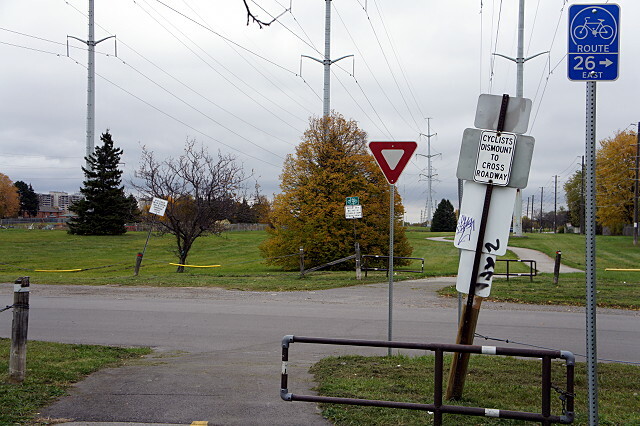 Given the potential for high traffic here—the path runs beside a parking lot, a public washroom, a playground, and a baseball field—I predict lots of conflict at this turn. 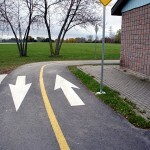 Here's the second wayfinding dilemma. 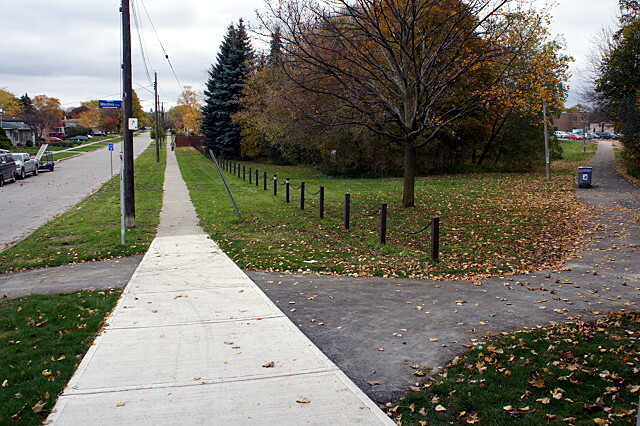 Which way does the path go from here? 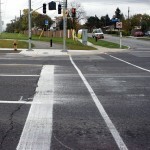 If you said straight and bearing to the right, you're wrong. 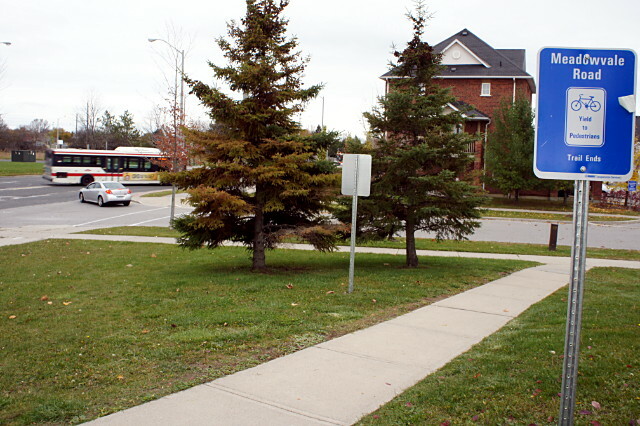 If you said up that unsigned little sidewalk to the left, you get the prize. 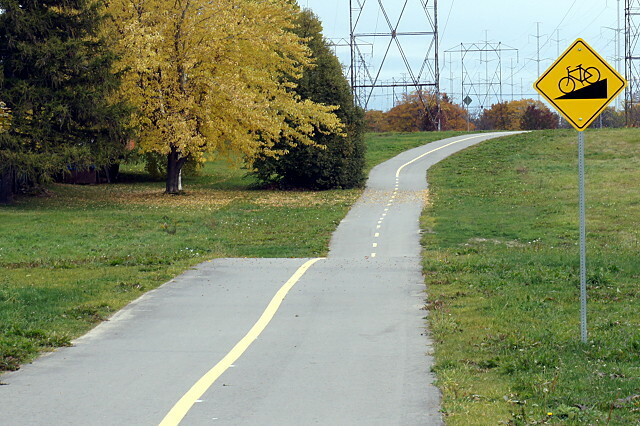 Granted, the actual path continues straight ahead, but that's not the way to either the rest of the Gatineau corridor or bike route 26, depending how you like to keep track of where you're going. 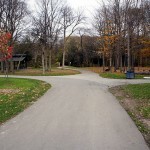 The main trail that bears to the right here dead-ends at Eglinton shortly after this turn, while making a left will take you to the road route that connects up with the rest of the trail. There is not so much as a single sign here to tell you that, though. 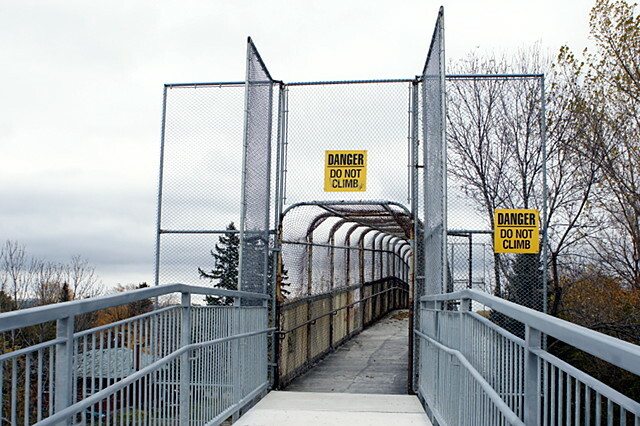 This pedestrian bridge across the Scarborough RT was improved to allow cyclists to use it, but the entrance remains about as ugly and uninviting as possible. 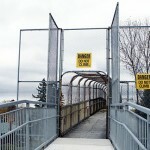 Chain link fences ought to be banished from all municipal projects. 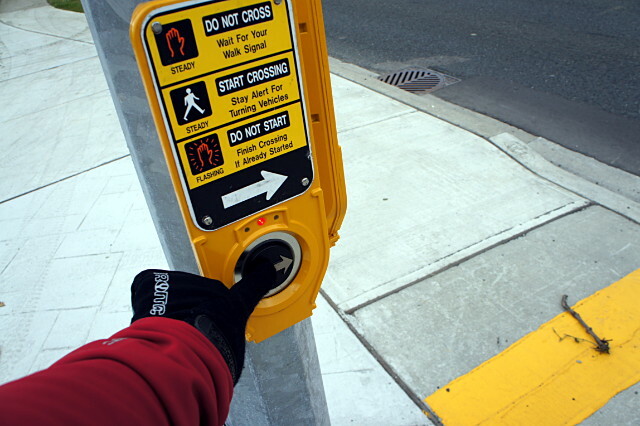 Once you've taken the unsigned left turn and gone across the fugly bridge, you end up on a sidewalk with, again, no indication of which way to go. 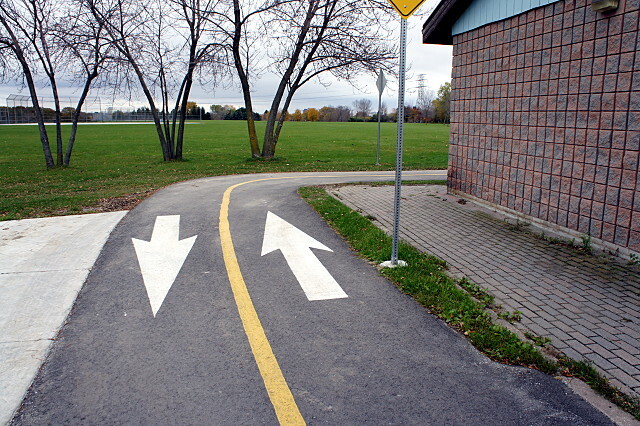 Since you've been riding on a shared path until now, you'd be tempted to follow the path to the right, but it quickly dead-ends in a school yard. Instead, you're supposed to see the tiny blue sign in the distance (see the little post beside the road, just to the left of the first telephone pole?) and figure out that you should go straight down this street. 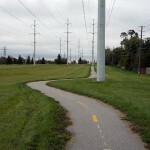 The signed route will eventually take you back into the hydro corridor. I'm not sure why there isn't a sign right at the bridge telling you so. 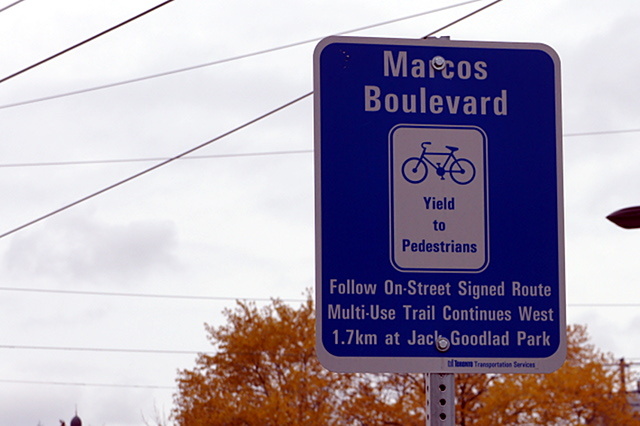 The on-street portion of the trail winds along a few side streets until you rejoin the trail at Marcos Boulevard. The annoying thing is that at the western end, there's no help whatsoever in finding your way onto the street routes. 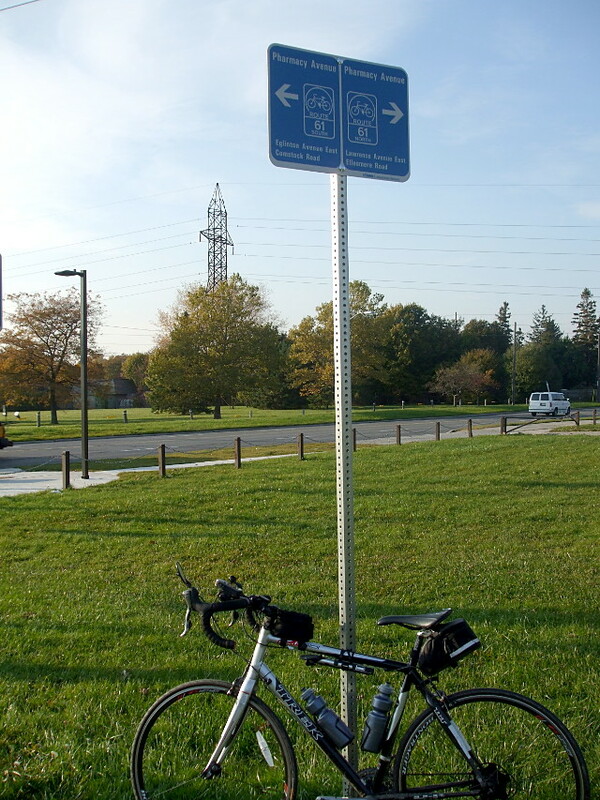 But at the eastern end, the sign explicitly states that you should follow the signed route, and how far it is. I like this sign. 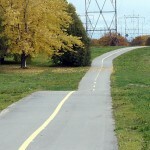 Toronto in general, and this trail specifically, could use many more of them. 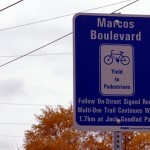 Still at Marcos Boulevard, the arrow pointing the way to route 26 west should actually be pointing straight ahead. 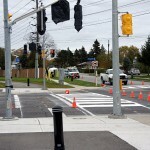 The bicycle signal at Brimley and Lawrence was not yet activated, but crossing was easy with the pedestrian signals. 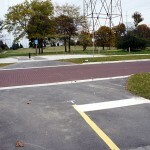 Trail users have to cross kitty-corner at this intersection; I couldn't help but think that this would be greatly improved by having a quick bike signal phase that holds up all traffic and lets cyclists go directly across the intersection in one movement. Ah, dreams. 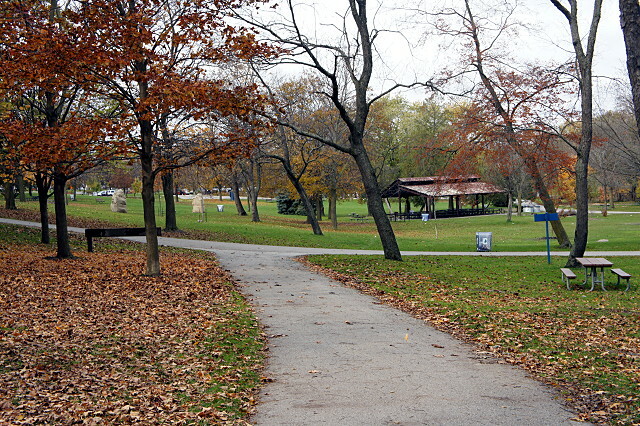 The trail briefly enters and then leaves Thompson Memorial Park between Brimley and McCowan. The only problem is that neither the entrance nor the exit has a single sign pointing the way. 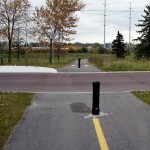 So at this T intersection, you have no way of knowing that the correct path for the Gatineau Trail is to the right. 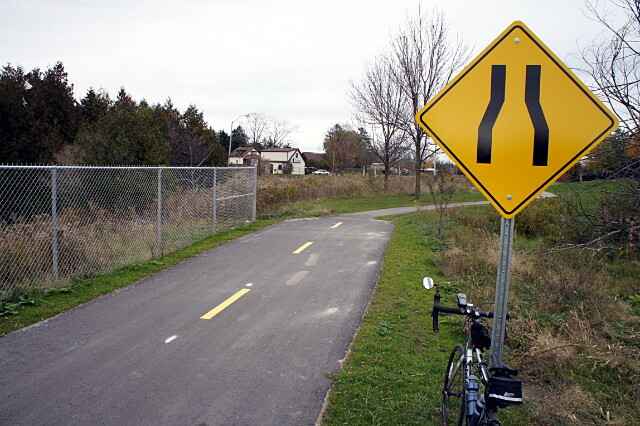 The wayfinding problem in Thompson Memorial Park continues when it comes time to find the path that leads out of the park and back onto the Gatineau trail. If you guessed that you need to make a right here, you get the gold star. Another quiet crossing at Benshire Drive. 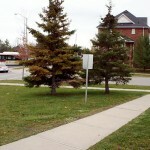 Although the sign warns of a steep hill, this hill is both shorter and less steep than many unmarked hills in the ravine system. One of the things I like about the signage along the trail is that it always give you distances to the next couple of streets. Conspiciously missing from all of the signage is any mention of distances or routes to major destinations along the path. For example, there's never any mention of how far the Toronto Zoo is (it's a lot closer than you think), or that you're coming up to U of T's Scarborough Campus, or that you're riding behind the Scarborough Hospital, or that you're 300 metres away from my dentist's office. 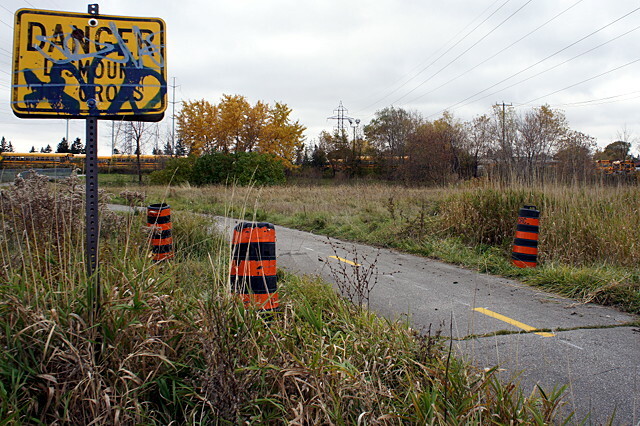 There are signs everywhere in the city directing drivers to the 401 and DVP, but not a single sign pointing cylists to this trail or, once they're on it, pointing them to other nearby trails or destinations. 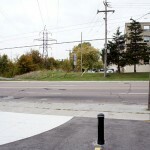 Most intersections, both major and minor, feature an entrance portal that will eventually include a bench, lighting, bike racks, and (I hope) signage. 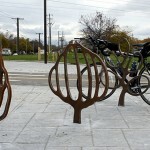 Most of them have a light and between one and four leafy-looking bike racks as seen here. 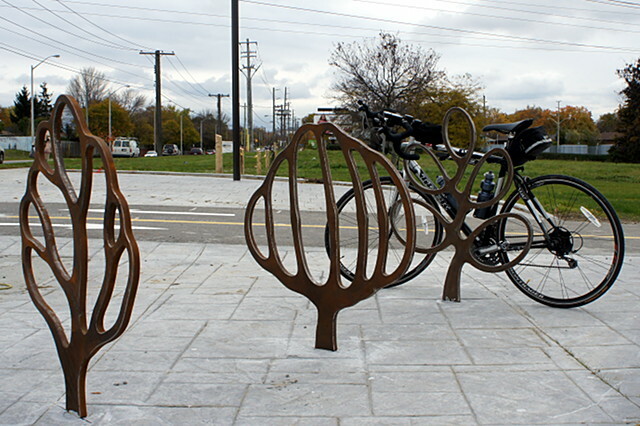 Named "Bike Plants," the bike racks were designed by Marianne Lovink and Scott Eunson, who are also responsible for the temporary installation at the former TTC Lansdowne barns. 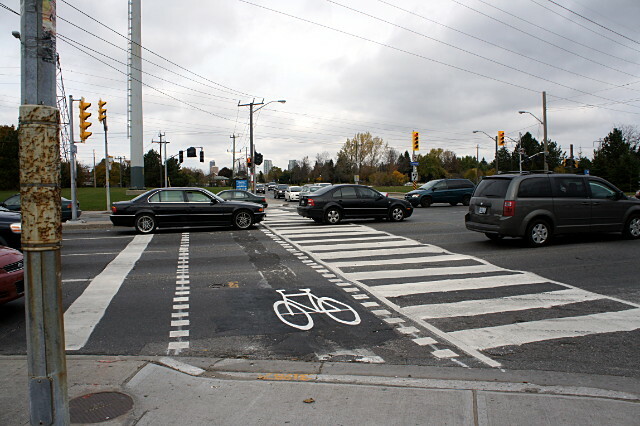 Hey, Rob F. Ford and Denzil Minnan-Wong: if you're serious about putting in a network of separated bike lanes (and I doubt you are), this is how you could easily run them virtually everywhere in the inner suburbs without taking up any road space. 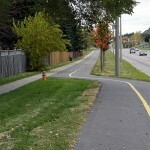 As I've noted before, there's tonnes of space in wide grassy medians to add dedicated bike lanes. 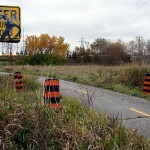 It's been done here along Ellesmere, and I'd be happy to point out everywhere else it could be done in this fine city. 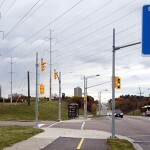 This portion of the Gatineau trail ends at the three-way intersection of Orton Park Road, Military Trail, and Ellesmere Road. The city's material suggests following Ellesmere to Conlins Road from here, but I suggest following Military Trail as it arcs north of Ellesmere before rejoining Ellesmere at the far end for the brief ride to Conlins. It's a bit longer, but much more pleasant. 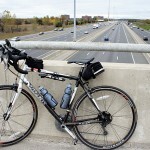 Cyclists cross the 401 via the bike lanes on quiet Conlins Road. 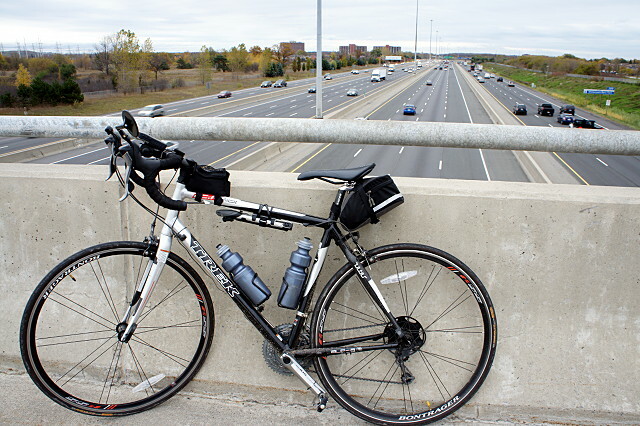 I believe this is one of only three crossings of the 401 in Scarborough with no on- or off-ramps. 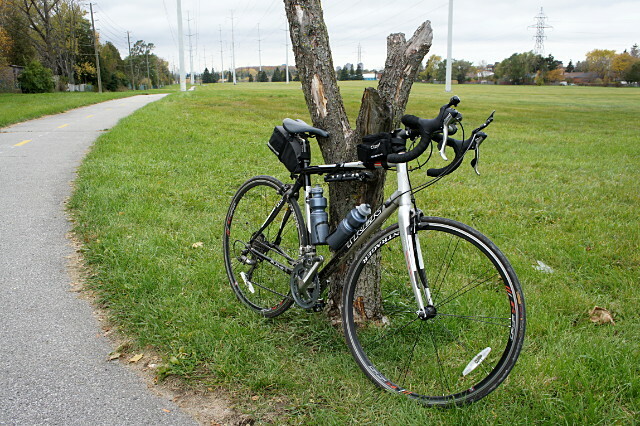 The other two are Midland and Birchmount. 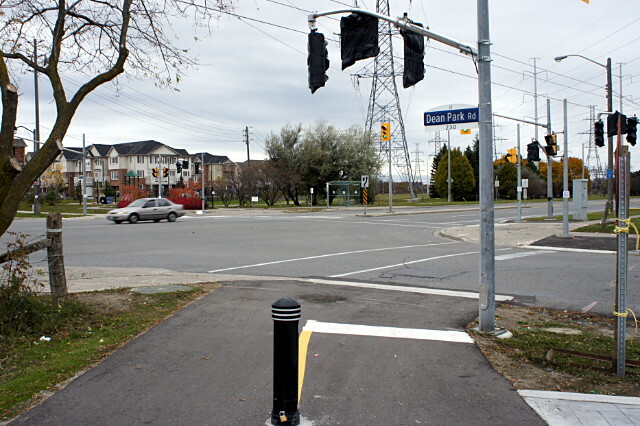 The trail at Sheppard Avenue requires another diagonal crossing. 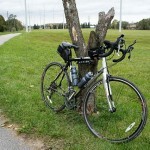 Once again, I dream of a bike light phase that allows me to cross in one movement. 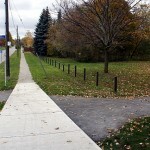 As we reach the end of the trail at Meadowvale Road, the new path narrows considerably to meet up with an older path. 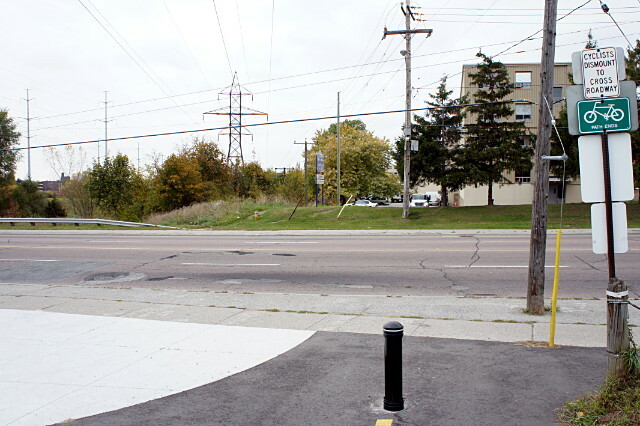 And finally, at Meadowvale and Hedge End, the Gatineau trail comes to an end. 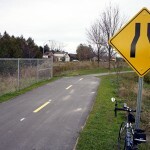 This part of the trail seems almost like an afterthought. 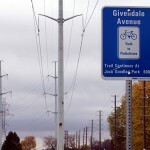 Unlike every other intersection, there's no portal, no bike racks, and no light. There's no sign telling you where you are. 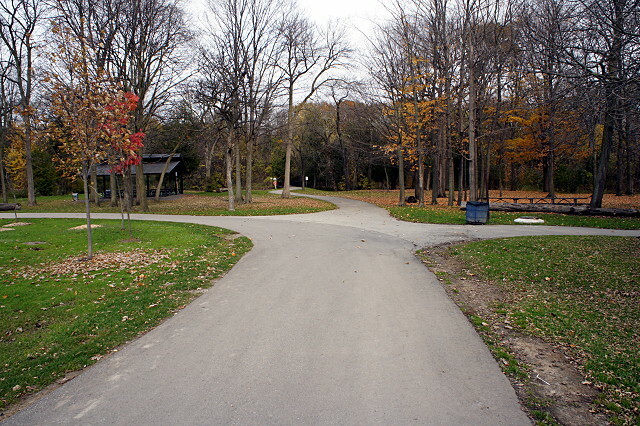 There's no indication that the path which will take you the remaining 1.5 km to the Toronto Zoo is less than 10 metres to your left. Someday, maybe. 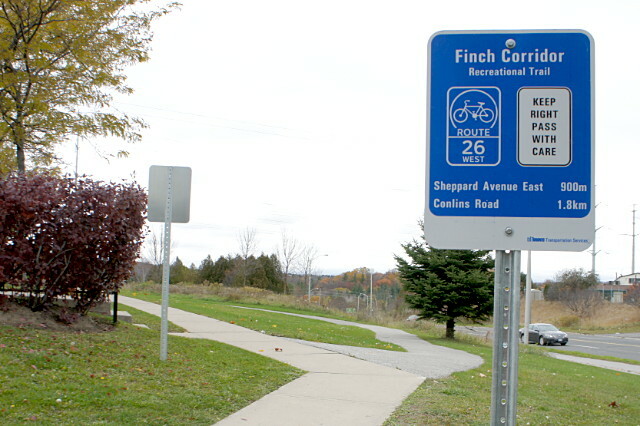 There's one final indignity at this eastern end of the Gatineau trail: the very first sign as you start heading westbound announces it as the Finch corridor trail. 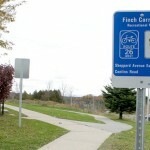 Unfortunately, the Finch hydro corridor is more than 3 km north of here, and it's more than 7 km from this spot to the easternmost trail up there. Oops. These are great pictures. I started riding this route as soon as possible in mid-march and its great to see the progress that has been made in the past few months. 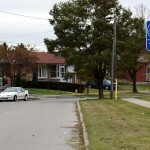 Did you get in contact with anyone from the city about areas that still need signage? Thank you for this! I’ve been living out of the country and when I get back to Toronto, I can’t wait to use this route. Great pictures!! 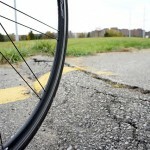 I recently started using this route (about 6-7 times so far this year) to get to my school – U of T Scarborough at Morningside & Ellesmere from my house at Coxwell & Danforth. Have yet to explore it farther but your page has inspired me! Funny that I’m reading the bit about the extremely long hill on Ellsemere before Neilson….earlier today I completed it but on the way home decided to try Military Trail instead…it was much, much better although I half expected a deer to jump in front of me. 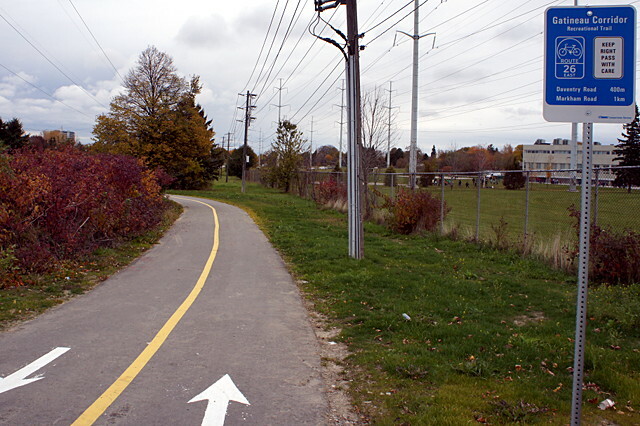 Just want to add that it did take me a few instances of trial and error to learn the correct way to stay on the trail when it leaves the off-road paths (I once did a full loop back to the start of the Thompson Park path) but now I know it like the back of my hand! !